Most styles of Japanese pottery are named after the city where they are made, such as Mashiko in Tochigi Prefecture, while others bear a family name, such as Raku. However, one style of pottery is named after a place that had nothing do to with its production. Mishima is a city in Shizuoka Prefecture that boasts splendid views of Mount Fuji and is known chiefly as a gateway to Hakone and the Izu Peninsula. As far back as 1636, there was a certain calendar published at the Grand Shrine of Mishima (Mishima Taisha) written in little squiggly kana lines. Because the "rope curtain" designs of 15th-16th century Korean Punch'ong stoneware resembled the lines of the calendar, works of this pattern came to be known as Mishima. A look at the world of Mishima pottery can be viewed at the Sano Museum in Mishima until Oct. 22, 2001, in an exhibition titled "Mishima-Goyomi Kara Mishima Chawan (From the Mishima Calendar to the Mishima Chawan)." 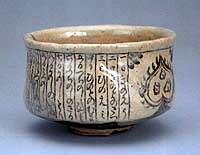 The Mishima name may be 17th-century, but the style itself goes back to the Koryo Period (935-1392) when bowls decorated in this way were known as Korai-jawan or Korai tea bowls. These were also inlaid with various motifs such as floral and animal depictions. A potter would incise the design in the body, fill it in with contrasting colored clay or slip and then cover it with a transparent glaze. This technique peaked in Korea in the 12th-13th-century Koryo celadons, deemed "first under heaven." It's also referred to as zogan.  Another style of inlay is called reverse inlay. This is where the potter cuts away the background, leaving the design in relief, then the background is brushed over with a slip and the excess is scraped away. In his book "Korea's Pottery Heritage, Vol.2," Edward B. Adams proposes that Korea's most important contribution to ceramics is the discovery of the inlay technique. The late Japanese scholar-potter Fujio Koyama also had humble praise for Korean wares when he stated, "The quietness and subtlety of Korean pottery are said to show the quintessence of the Oriental spirit; its quiet elegance, simplicity of form and style have been compared with the profound and exalted spirit of Zen Buddhism; it gives rise to the feeling of loneliness from which a mysterious fascination springs." Tea masters must have been similarly moved since they specially ordered Korean chawan tea bowls, most notably from 1639 to 1717, from the many kilns near the seaport of Pusan. Many of these ended up in Hakata or Kyoto and were often given as gifts by shoguns to their loyal daimyo. In fact, certain chawan might have the same value as large fiefdoms. Even today they command unbelievable sums, on the order of $500,000, if they ever make it on the market. Most do not, since they are the treasures of many Japanese museums and a few privileged private collectors. The first mention of a Mishima chawan comes in Eiroku 8 (1565) in a tea diary. Yet the mi kanji recorded in this diary is that for "to see," while the city of Mishima uses the kanji for "three," its whole meaning being "Three Islands." Some scholars therefore believe that the Mishima for which the pottery is named is derived from an island off the coast of Yamaguchi called Mishima, its kanji being the "see" one. A stopping place for trade, city-bound users of the tea bowls would only hear the island's name "Mishima" without seeing the kanji. This ambiguity has caused some confusion and leaves a page of the history of Mishima ware unwritten. The current exhibition has some famed Mishima chawan, including an o-meibutsu ("famed piece") named Mishima Oke. This chawan was once in the possession of tea master Sen no Rikyu (1522-91), and is now in the collection of the Tokugawa Museum. The name is believed to come from its distinctive shape, oke meaning bucket. Mishima Oke has five rows of inlaid designs -- three are floral, one is slanted lines and the upper is wavy lines. It's still quite modern looking, even though it dates to the 15th-16th centuries. Mishima Oke radiates a feeling of warmth, controlled casualness and timeless beauty, as does its equally famous -- if quieter -- cousin, the meibutsu Ni-toku Mishima chawan, which also was in Rikyu's collection. All of the other chawan of this era are much simpler in design -- until the end of the Edo Period, that is, when Japanese potters started painting the actual calendar designs on the chawan. Shards of these have been found throughout Japan, including some in Tokyo's Shinjuku Ward and at Himeji Castle. Other styles of Mishima on view are Hori-Mishima (carved), Ko-Mishima (old), Mishima Koyomi-de (calendar "rope curtain"), Mishima-Hakeme (white-slip brush), Hagi-Mishima and Karatsu-Mishima. In addition, other pieces related to Mishima design are on display, including screens, prints and lacquer wares -- and those oh-so-important old calendars. Sano Museum (0559) 75-7278 also has a lovely garden that visitors can stroll around. It's located at Nakata-cho 1-43, Mishima, open 10 a.m. to 5 p.m., throughout the duration of the exhibition. Admission is 800 yen for adults and college students,400 yen for others. The museum is a 15-minute walk from JR Mishima station or you can take a Tokai bus from bus stop No. 4.